The PLMA Connected Devices Interest Group seeks to examine the costs and benefits of all types of utility-sponsored programs that leverage thermostat technology to deliver the demand response, energy efficiency, or other system benefits. A group goal is to identify the resources and partners that help articulate a comprehensive value assessment of the Demand Response and Energy Efficiency benefits associated with Smart Thermostats. The group does not focus on a specific technology or solution. This thought leadership publication is a compendium of eight energy utility, manufacturer, and solution provider viewpoints. The report is now available for free and a free webcast featuring the report’s editors and co-authors is set for Monday, March 26 at 12:30pm Eastern. Read the news release and register for the webinar HERE. All registered attendees for the Interest Group Activities are invited to attend the Connected Devices Interest Group Meeting. Presented Nov. 13, 2017 before the 36th PLMA Conference in Cambridge, Mass. Thermostat Interest Group Pre-Conference Meeting in Nashville, Tenn. Presented April 3, 2017 before the 36th PLMA Conference in Cambridge, Mass. Presented, November 6, 2016 before the 34th PLMA Conference, Delray Beach, Fla. The Dating Game plus dynamic presentations and discussions on relevant topics. Presented April 18, 2016, before the 17th PLMA Spring Conference, San Francisco, Cal. One of the workshop sessions is going to be a fun format for a real discussion on the benefits and drawbacks of different technologies. In the spirit of the Family Feud, we've come up with real survey questions to ask the teams, and we're looking for experts (that’s you!) to answer them for us. We would appreciate if you could take a few minutes to complete the survey. The results will help make this more fun and more genuine. And the best part: this should take less than 5 minutes. Listen to this Thermostat Interest Group Discussion about industry developments related to thermostats and a Charlotte workshop preview. During the last thermostat interest group meeting, we heard a variety of perspectives from utilities and vendors about their experiences with diverse program designs. This meeting on November 2, 2015, in Charlotte, NC, was designed to take the conversation one step further and focus on the future of thermostat program design. The thermostat market is catching fire and there is no shortage on ideas and designs to capture customers’ attention, but what is the right approach for you? This will be more workshop than meeting, and intended to help everyone leave with the tools and insight necessary to start designing the programs of the future today. 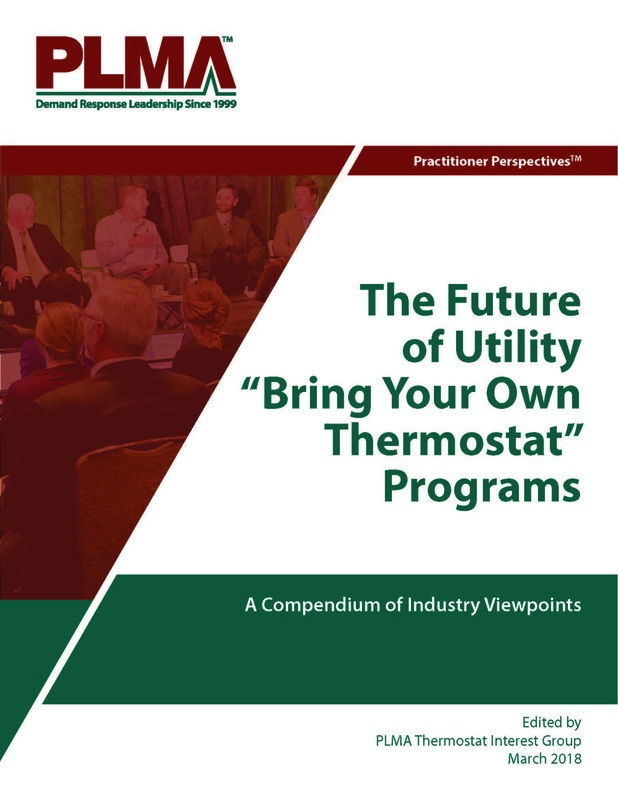 Thermostat Interest Group Meeting: Can Manufacturers and Utilities Implement Together? The April 27 meeting of the PLMA Thermostat Interest Group Meeting will follow the format of the November 3, 2014 PLMA Thermostat Interest Group meeting held in Philadelphia. This format is intended to be more conversation and dynamic in nature to meet the needs of all attendees. The primary focus of this meeting will be program implementation. This will be an interactive meeting with two short presentations on the bring your own thermostat (BYOT) model implementations. Similarly, there will be two short presentations focused around utility provided devices. These presentations will be used to stimulate a roundtable style discussion comparing the challenges and benefits of the different type of programs that are being managed for thermostats. Please join us for a spirited discussion around the latest activities related to smart thermostats. Presented Nov. 3, 2014 before the 15th PLMA Fall Conference, Philadelphia, Penn.